We are back from Market with lots of goodies! We could not miss the Peach Parade & Festival! It's 9:00 o'clock! Parade time! Time for the Parade! I hear the sirens! I caught a Cup! Yeah! Yummmm! Good Sucker! Perfect Catch! I love all the pics of your grandbabies! Church in the Wildwood print, Rustic Candle Holder encircled with Cotton and Eucalyptus ring, Nativity Print (I'm sorry sold out! )and hanging galvanized tin JOY! Colorful Church in the Wildwood print! Scripture embossed wooden frame! Mantel Reindeer, Pottery Pitcher, Tiny pine cone filled Glass Apothecary Jar, and Rustic Open Wooden Lantern are all great statement pieces for your Christmas or Year round Mantel! Who's got their hand in the cookie jar! Santa and his sleigh ceramic cookie jar! Perfect to stash his cookies until the Night Before Christmas! Unveiling Christmas and the Goodies! Sip and See! Goodies everywhere! Visiting with friends, sipping punch, nibbling cookies, and Christmas Shopping! Perfect Saturday! Decisions, Decisions! Ornament parties, Ornament exchanges, Decorating our own trees! Lots of Friends Meet Here! Perfect chilly weather for Holiday shopping! And They Won't Loose the Pieces! Selecting Melissa & Doug Toys for the Littles! Love my Baby Dolls and Purse! I love my touchy Animal books! 10 Months Makes a Big Difference! New Sister is almost one! Big Brother holds Baby Hannah so gently! He is such a sweet Big Brother! All three older siblings love their new little sister! Caroline, Mason Man, and Kate send you Thanksgiving Greetings! M, K, & C display their Thanksgiving Turkey Thankfulness Banner! Just a Little More Dirt! It's Not Too Hot Out Here! Pawpaw helps C with her lipstick! K loves her Pawpaw! "You're so funny Pawpaw!" The Guys and their Wheels! Love that mucky yuky mud! Art Camp with Melanie Massey, her very first for Little Folks,was the highlight of C,M, & K 's Spring Break! Their Owls are displayed in each bedroom at home now! Movers and Shakers C,M,&K loved working on multi-media Owl "paintings" even more proud to show them! Caroline, Mason, & Kate showoff their owl pics that they created at their Art Camp a-la Melanie Massey! The Cousins Weekend at Dellas! Our Pride of Louisiana pose in front of the Pride of Mobile Azaleas! You Gotta Love One Another! Yes we do Love our Brother! You're Sisters and a Brother! Started out trying to document drought by low pond level, but it turned out to be a pretty background with the fall foliage still on display! Mason Man Speeds past the girls on his plasma car! Kate watched the Market Center turtles sunning! 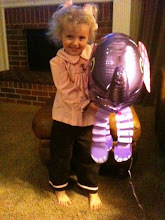 C holds down Kate's purple elephant friend from her market visit! I will call Him Jesus! Kate plays the part of Mary in school Chapel Nativity play! School Play! Wiseman Mason presents his gift to the Baby Jesus and Mary, played by Kate! Nope! Not ready, no one! K & M practicing poses! Christmas Card Photo Session 2011! At the pond; won't do, dog in pic! Eager to start Christmas Card Photo Session! HA! Pawpaw & C stop just for a minute! Sisters and Brother! You're sisters and a brother; you've got to love one another!...composed by Aunt Milna! C picks and mixes colors for her stick! K paints details on her stick! Pawpaw demonstrates Apple Marshmallow teeth for K! Ready for the Tooth Fairy! C and her tooth fairy cat are waiting for the Tooth Fairy with her new apple teeth! The marshmallows are the best! Greeting her peeps at the pageant! Miracle! She wears a hair accessory! Field of Flowers and Dreams! Thanks for the suckers Pop! A Man and His Dog! I wonder if Mason will grow lettuce in his hair? A time to plant beans, lettuce and spinach! Bubbles on the porch! Need refreshment: Carpi Sun! C is amazed at her bubbles! I'll blow a few over here too! Working together to make our Bunny Hutch just right! Yes some of us stayed in our jammies all morning! Okay, all of us! I think we need to put one right here! The flowers should go on the top! M & C admiring their work! " When can we eat it?" Mason & Caroline "Please, Mawmaw?" It's Clean-Up Time! It's Clean-Up Time! Kate & Caroline decorating their eggs! K & C decorating away! Mason putting his Jelly Bean Cross together! Bake, Frost, & Sprinkle! YUM! Mason & Kate decorating! Notice our Hot Wheels Necklce; We made them in Disney Princess too! We always need a little milk with our cookies! Pizza Night with all four GRANDS! You know it's good when the Teen Grand says so! New line of custom door designs! Ready for your door! Ready for your April front door! Memorable Gifts for Frillseekers of All Ages! Bunnies deliver bath fizzie eggs! Oxidized Silver Heart on Rolo Chain or Leather! Hot Chocolate & Marshmallows and Lemon Cakes UMMMMM! Especially the marshmallows! Maybe it should be called a Marshmallow Party! My Favorite Toy: Slice and Bake! Wooden cookie set: Wooden cookies velcro to pan to "bake", then decorate frosting sticks on too! Fun for boys and girls! Wooden Food for Play Kitchen! Assorted stickers for loads of creative fun! Stick to paper and decorate the scene! 21st Century Paper Dolls! Wooden Doll has a stand and magnetic clothes! Fun! Wooden Birthday Cake and Decorations! Bags, Bags, & More Bags! Cheap Tote! Stow all your shopping treasures, lunch, and water! MONOGRAM ME! Have a name monogrammed for just $5! Personalization will make your little monkey feel very special + help him keep up with his backpack! Ready for Mother's Day Out! Great backpacks in a rainbow of colors! Make it special with a monogrammed flap! $5 monogram, initial, or name in one color! Nice to keep that water bottle or baby bottle cool on hot days! Great $12 gift! Haul it all! Keep Hot Foods Hot; and Cold Foods Cold! When in doubt, throw it out! Monogrammed & Ready to Go! FYI:Monogram Lady Picks up on Fridays! Picture your little honey on your tree! We are thankful! This is a true pic of AdOrAtIoN! Happy Thanksgiving Everyone! Martha and Paula catching up! Fleru de Lis with lots of sparkle! Accent pieces, centerpieces, serving pieces! Come Ye Thankful People Come! Pilgrim S & P used with greenery make thankful centerpiece accents. Fleur de Lis for every style! Fall Harvest Pears under great glass dome, candlewick cakestand, fruit plates, stone cross, and oak leaf garland all for fall decorating September through November! Begin every day with gratitude. Say it out loud: "I am thankful for ..." We are so thankful for you, our good friends! We hope you enjoy visiting Lusiana Traditions. We are thankful for our dear sweet families. We are thankful for this grand country and our freedoms, especially freedom to worship as we please and the freedom of speech to tell about it! See! once you get started thanking God, you just realize your blessings overflowing and the list goes on and on! Speaking gratitude helps us to be more grateful too! Thank you Lord for cool seasonal weather for Thanksgiving! I am thankful for the new friends I make every day at Lusiana Traditions and for renewal of friendships with people I haven't seen in a while! ID your luggage with colorful inspirational TAG! It's just a little early! We all have blue and green nails now! Use just one or many! Yummy cuties to dress up your baskets! Just a little something to Tempt you! Fabulous FDL Jewels! Geaux Saints Darlin'! Christmas Card 2009: Whew! It only took us 25 tries! It's a matter of odds: the more pictures you take, the more likely you are to find one good picture! Decorating Christmas Cookies for the Hot Chocolate Tea Party! I like green frosting and LOTS of sprinkles! I said LOTS of Sprinkles! Lots of green frosting is good! This is the part I like! Eating the Cookies! Just keep 'em coming! I like mine without frosting! Yea! Cookies Pass the Test! I vote yes! for cookies! What are these shiny things stuck to my feet? Smile for the Camera Caroline! Okay! Adults should stay ready! The photographer just keeps on snapping! We're not ready...I'm not ready! Busy giving directions! The guys are ready but no one else is! Dad; Aunt Amy why are you acting so funny? Let's just all get ready! First step in any family Christmas card picture! Get them together! Bing! Idea! What do guys like to do? Ride 4-Wheelers! 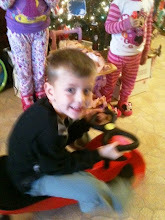 You can sit on the 4-Wheeler for your Christmas picture! Smile big guys! We can take one good pic or 25 pics until we get that good one! Yummy! MawMaw's Santa Claus cookies with LOTS of thick yummy frosting! All this red frosting won't stain my shirt MawMaw! I'll take it off when I'm finished! These are Quite Delicious Cookies MawMaw! Caroline selects her Santa cookie! Ummmm! With every bite! This was worth the Christmas Card Picture session! Magnificent Christmas Ball Decoration for Mantel, Hutch, or Cabinet Top! Beautiful natural wreath and very realistic holly garland! Salt & Pepper in Fleur de Lis stand and spoon rest. Silk covered photo albums topped with ribbon and Mother of Pearl button! Chocolate Brown Silk with blue, beige, and dark chocolate embroidered dots! 2-UP albums: Each page holds two 4 x 6 photos up or one 5 x 7! Gingham checks fabulous for our Southern Fall! Wear with short or long sleeve shirt or blouse for cooler weather! Perfect! Monogrammed Turquoise Top & Pants! Turquoise gingham checked outfit; top and bottom trimmed with brown ruffles and topped off with Giant initial monogram. Special order bows to match our darling outfit! Very nice hostess gift! Our MonogramLady will put the family name on the great Pumpkin and just add pumpkin soap or a little spice pumpkin candle! We can order monogrammed jewelry and soaps Early for Christmas delivery! Monogrammed Jewelry, Soap, Address Stamps, Tote Bags. Order single initial monogrammed soap ! Great "little happies"! Mary Lake Thompson dishtowels are the best for display or actually drying dishes! Sets of two towels! All Dressed Up & Places to Go! We are all thankful to God for all of our many blessings in this great country! Uh! Oh! Another Little Trickster! Keep the Home Fires Burning! Gifts for others and yourself! For This Child I Have Prayed! Nursery Crosses for little boys and girls. I know you have something really neat in there. Can I see, please? Just a peek! Lusiana Traditions has lots of sweet little gifts that I would just love to get my little hands on. Here Caroline, I'll share! It's great glow in the dark nail polish! Maw Maw will paint your toenails just like she did mine! "I am wonderfully made" and "For this child I have prayed" are just two of the blessings on the darling nursery crosses. Nursery Crosses in three sizes and prices! We thank you for Stepping Into Christmas With us this year! Christmas Blessings to One and All! The House is Full of Christmas! Great Little Back to School Happies! Sibling Sets! It's a Match!